A roomy, cylindrical-shaped container. Made of curved plywood and available in a natural, brown or dark oak finish, in teak or in a white or grey colour. 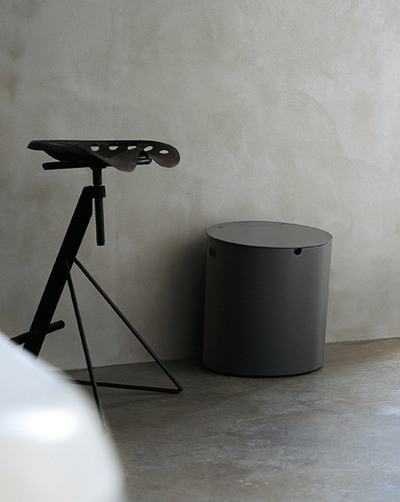 The Basket container can also be used as a seat. Holes in the sides make it easy to move it around without any need to open the lid. Wall or ceiling lamp with body in natural anodised aluminium, or painted white, orange or green. Diffuser in white toughened glass with circular screen printing. Available in white, grey, Green and orange. The youthful and amusing accessories in the Bucatini range consist of a stainless steel cable sheathed in a transparent plastic material, used as a towel holder or support for trays, white ceramic containers, accessories and mirrors. Memory is a circular, square or rectangular mirror with rounded corners, surrounded by a white lacquered frame, and can be fitted with LED lighting positioned behind the reflective glass. Also available in a frameless version. Based on pure function. Without ostentation. Simple forms with an extremely elegant expression. Stainless steel accessories now available also in brushed and burnished steel version completed with white Cristalplant® biobased elements. 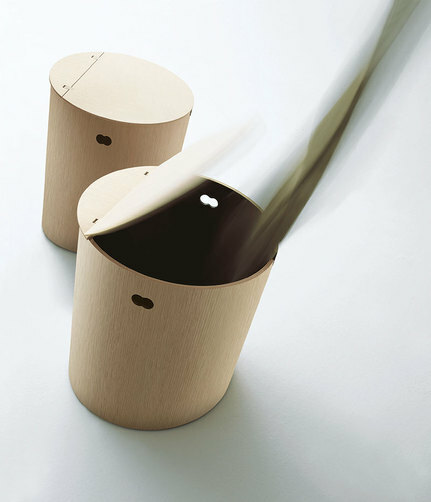 Quadro's Qbic stainless steel accessories designed by Hand Thyge Raunkjaer. A perfect complement to match our stainless steel bathroom products. A practical tool for the organization of the bathroom, always at hand. Freestanding and adjustable in height, with shelf, towel rack and toilet roll holder in polished stainless steel with basis and shelf in white Exmar, to complement washbasins, bathtub or sanitaryware. A small system of swivelling mirror-containers, designed to be used in combination with washbasins. The lower part of the unit conceals a mechanism that enables the mirror to rotate, allowing easy access to the storage container behind. Single elements can be combined in various ways, emphasising either the vertical or horizontal dimension, according to the position of the surrounding "satellite" elements. The MDF containers are finished in matt white lacquer and come complete with 4 anodised aluminium shelves. This particularly "minimal" rectangular mirror can be hung from the ceiling by means of a stainless steel wires and supports. 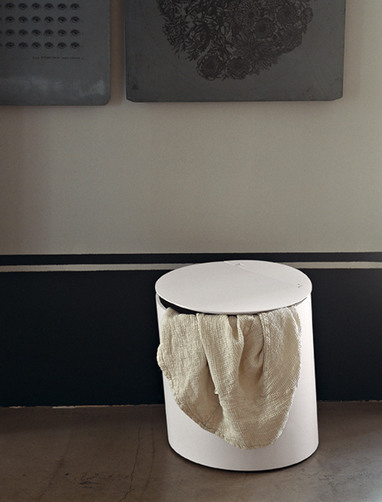 Completely made from white Exmar, this is a useful towel holder and shelf to be placed near a bath tub or washbasin. Range of wall-mounted accessories characterised by the infinite compositional potential of its elements, which include towel holders, supports for soap dishes, glasses and shelves that can be combined to form multifunctional bars around the washbasin, bathtub and bidet area. The dynamic quality of the range makes its products the ideal complement for any of the other product ranges in the catalogue. The range also includes wall-mounted lights that produce diffuse light. Finish: polished or satin-finished stainless steel, now available also in brushed and burnished steel.